Travel the world’s barbecue trail, and you’ll find people utilizing unique fuels to grill. In parts of Asia, for example, you’ll see coconut charcoal briquettes or extruded coconut charcoal. Japan produces some of the highest quality of charcoal on the planet from a species of oak called ubame. The charcoal is called Bincho-tan. It burns very clean, and is outrageously expensive. Visit the Chilean countryside, and you’re likely to see homemade ovens on the landscape called horno de barro–“oven of mud”. Resourceful Chileans burn a nuisance tree, espina that is the bane of farmers: It grows in profusion along fence lines and has strong, wickedly sharp thorns that can puncture automobile tires. 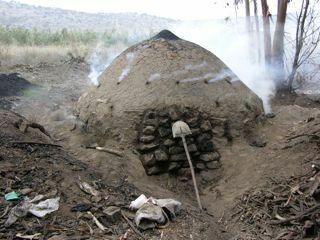 They pile it in a conical shape–see the photo above–and let it burn in an oxygen-starved environment for several days. 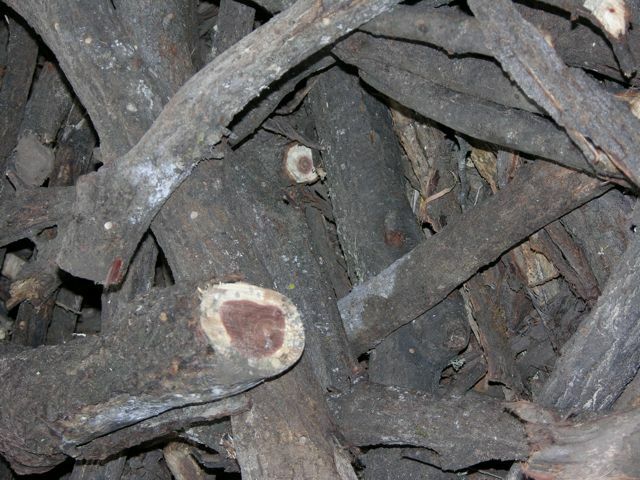 Chilean espina wood destined to be made into charcoal.